"I work for West Central Initiative. It's a regional community foundation that serves nine counties in west central Minnesota," I tell people. Then I might add: "We work to strengthen the economy of the region so that families, communities and businesses can thrive, and we do that using the tools of economic development, community development and philanthropy." It's a quick elevator speech that paints some broad strokes about West Central Initiative, but the picture is still pretty hard to make out for most people. That's why WCI staff and board rely on stories to make what we do come to life. We love to talk about the communities that are using our component funds to meet needs. Component funds allow advisor committees to focus on the charitable need and leave the administrative tasks to WCI. When the Pelican Rapids School District had a shortfall of $600,000, the community and school alumni stepped forward to raise funds to help close the gap. WCI worked with organizers to map out a successful fundraising effort and establish the Pelican Rapids School Fund. We have some great stories to tell about our loan clients too. A unique aspect of WCI is our ability to lend funds to help finance business start-ups and expansion. When the Evansville Care Campus closed its doors, local residents Arlynn and Susan Johnson stepped forward to purchase the senior care center in order to keep jobs and services in the town of 600. WCI was able to help complete the loan package to make it possible. We like to say we are "more than a foundation." One example is our loan program, another is that we are contracted by both the U.S. Economic Development Administration and the Minnesota Department of Transportation to coordinate economic development planning and transportation planning in our region. Among his many duties, Planning Director Wayne Hurley facilitates the regional Transportation Alternatives Program (TAP), which offers MnDOT funding to communities and counties for transportation enhancements, Safe Routes to School projects and scenic byways. TAP funds were used to create a series of bike trails to connect the city of Battle Lake with Glendalough State Park four miles away. 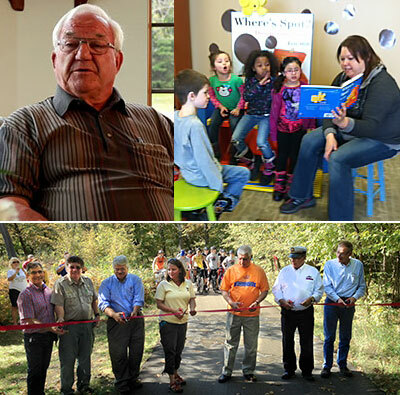 Last year, bike enthusiasts and residents from around the Battle Lake area gathered for a ribbon cutting to open the last trail link that completes a lovely, 12-mile loop past lakes and farmland and through woods and prairie. We're awfully proud of the work of the Early Childhood Initiative. WCI established 10 ECI coalitions in our region, one in each county and in the White Earth Reservation. It's hard to pick just one story to tell. These coalitions are bringing together a diverse group of people and organizations--families, schools, public health, law enforcement, health care, social services, care providers, libraries, public officials--to tackle some big issues in their communities: literacy, social-emotional development, school readiness, teen parenting, oral health, child care and more. If there is a link to the health and well-being of our youngest children, the ECI is there! These are just a few of the stories we tell about our work and our region. We have so many more. We’d love to share them with you. Ask any time!